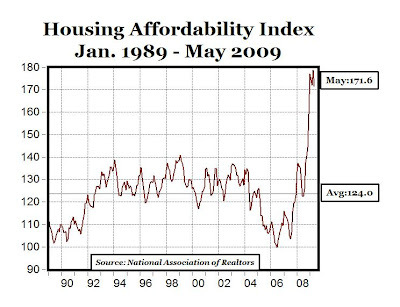 Housing Affordabilty Index: 7.2 Point Drop in May From Rising Home Prices: Market Reached Bottom? The National Association of Realtors' Housing Affordability Index remained high in May (171.6%) by historical standards (see chart above, data here), but fell by 7.2 percentage points from April's record high of 178.8%, mostly because of the increase in the median home price from $166,000 in April to $172,900 in May. The 7.2 point May decline was the largest monthly drop in the HAI in four years, providing further evidence that the housing market may have reached a bottom. Watch for the HAI to continue to fall this year, as both home prices and mortgage rates rise and the real estate market continues to recover. Number of bank failures this year so far: 45 (FDIC data here, click on "Produce Report"). Bottom Line: The worst of the banking crisis is behind us, the percent last year was 2.69%. The general improvement in global financial conditions since March has fostered a marked improvement in investor sentiment and led many to inquire when (rather than if) the current U.S. recession will end. Increasingly, market commentary has focused on evidence of “green shoots” that would suggest the rate of economic deterioration is at least slowing. But how can we know that the right signals are being captured, and—more important—how accurate have such measures been in identifying the turning points of past business cycles? 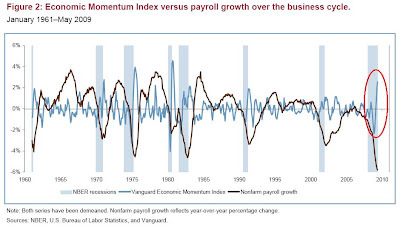 In this brief, we unveil a proprietary Vanguard Economic Momentum Index consisting of more than 70 financial and economic indicators that in the past have anticipated (to varying degrees) the beginning and end of economic recessions. This new index is specifically designed to anticipate turning points in the business cycle, and it differs in important ways from several other widely tracked indexes of leading indicators. As of the end of May 2009, the Vanguard Economic Momentum Index indicated that a U.S. economic recovery likely will begin by the end of 2009. 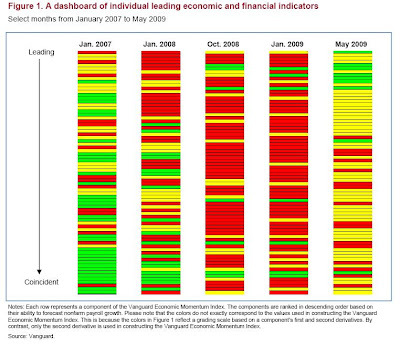 Red: Indicator consistent with future employment losses at an increasing rate. Yellow: Indicator consistent with future employment losses at a decreasing rate. Green: Indicator consistent with future employment gains. Components shaded either green or yellow in Figure 1 are considered evidence of so-called green shoots, since their most recent rate of acceleration is consistent with an eventual economic recovery. Yellow shading reflects a recent improvement in the component’s rate of change (i.e., its rate of decline has slowed, or its “second derivative” has turned positive). 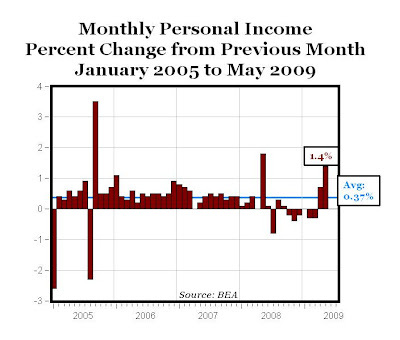 Figure 1 shows a notable recent improvement in various economic and financial indicators, especially through May 2009. Some examples of such components are the S&P 500 Index, the shape of the Treasury yield curve, corporate bond spreads, and certain housing and manufacturing statistics. Encouragingly, the components near the top—those that have been the most anticipatory leading indicators of future economic conditions—have changed for the better ahead of those toward the bottom, although the improvement in individual indicators is far from unanimous. 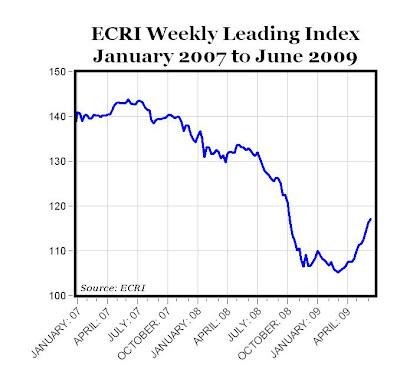 Figure 2 below (click to enlarge) illustrates that after bottoming in November 2008, the index turned positive in February 2009 and continued that trend into March and April. This sharp reversal brings the index to levels that were associated with past economic recoveries. Indeed, by the end of May, the index was near the highs reached following the deep recessions of the mid-1970s and early 1980s. Based on historical patterns, the index’s climb suggests a high statistical probability that a U.S. recovery will begin by the end of 2009. MP: Based on the pattern of this index over the last eight recessions, and especially in the four severe recessions of the 1970s and early 1980s, it looks very likely that the current recession might already be over, or will be ending shortly. MyFarm was started by Trevor Paque, a young mortgage broker, who decided in 2007 to get out of the office and take up farming. Hardly a new idea, but Paque took a new approach. His business plan called for building, planting, and harvesting vegetable gardens in small overgrown, weed-infested patches of soil that many people in San Francisco call back yards. Pricing for each garden includes $50 for a site analysis to check sunlight and soil; $600 to $1,000 to build raised beds, install drip irrigation, and plant seeds; and $20 to $35 for weekly maintenance and harvesting. As part of the weekly maintenance, the farmer harvests a box of vegetables for the owner. To test the market, Paque posted an ad on Craigslist and within 20 minutes he had 200 responses. Over the years, the feminist fictions have made their way into public policy. They travel from the women's-studies textbooks to women's advocacy groups and then into news stories. Soon after, they are cited by concerned political leaders. President Obama recently issued an executive order establishing a White House Council on Women and Girls. As he explained, "The purpose of this council is to ensure that American women and girls are treated fairly in all matters of public policy." He and Congress are also poised to use the celebrated Title IX gender-equity law to counter discrimination not only in college athletics but also in college math and science programs, where, it is alleged, women face a "chilly climate." The president and members of Congress can cite decades of women's-studies scholarship that presents women as the have-nots of our society. Never mind that this is largely no longer true. Nearly every fact that could be marshaled to justify the formation of the White House Council on Women and Girls or the new focus of Title IX application was shaped by scholarly merchants of hype like Professors Lemon and Seager. ~From Christina Hoff Sommers' commentary in today's Chronicle of Higher Education (also at the AEI website here). Sorry for the light posting over the last few days - I've been on a road trip since Saturday, and for the last 24 hours or so many of the Blogger blogs have been unable to accept new posts (it's still not fixed yet, I found a way around it). And I'm now staying at a Trappist monastery in Iowa for a few days (with no Internet access), before driving up to Minneapolis tomorrow to see Dr. John and the Lower 911 Band at the Dakota Jazz Club. I'll be spending the month of July blogging from my hometown of Minneapolis ("returning to my native village," as they say in India). My first stop was Cedar Rapids, Iowa, where I lived for part of my grade school days, from kindergarten through 6th grade, and I toured the flood area on Sunday, and I was surprised at how devastated the area still looks one year later. The vast majority of the 4,000 homes that were affected are still abandoned, and will probably never get rebuilt (too old, too damaged, too expensive to rehab, no insurance, etc.). Scattered among those abandoned homes are a few that have been rebuilt with residents living there, and a few that are under construction. But it really looks pretty grim in "Iowa's Katrina" neighborhood. 1. There are portable toilets scattered around the worst-hit neighborhoods, I assume for workers, displaced residents, inspectors, etc. in those neighborhoods, many of which must not have water or sewer. 2. 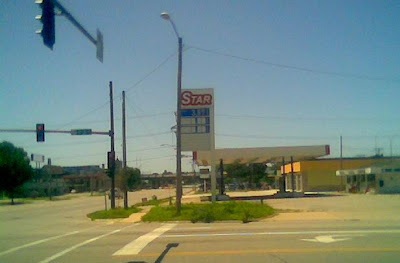 The gas station above in the photos, which was under water on June 13, 2008 at the height of the flood. 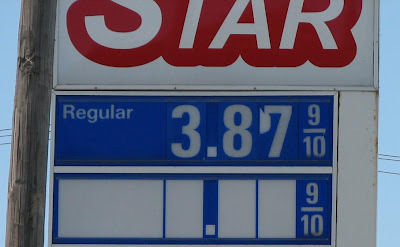 A year later, nothing has changed, including the year-old price on the sign: $3.87 per gallon. Here's a recent NPR report "Cedar Rapids, Iowa, 1 Year After Record Flood"
It's well known that for the SAT mathematics test, a) male high school students in the U.S. have higher scores on average than females, b) the gap is large and statistically significant (+30 points), and c) the male-female math test score gap has persisted over time, since at least 1971, and probably much longer (see chart above, data here from the Dept. of Education). In 2007 the SAT was taken by 798,030 females but only 690,500 males, a gap of more than 100,000 people. Assuming that SAT takers represent the top portion of the performance distribution, this surplus of females taking the SAT means that the female group dips farther down into the performance distribution than does the male group. It is therefore not surprising that females, on average, score somewhat lower than males. The gender gap is likely in large part a sampling artifact. MP: In other words, it is only because more females than male take the SAT exam that males score higher on average than females, and if the sample sizes were more equal, the difference in mean math test scores would disappear. Ceteris paribus, if the number of females taking the math SAT exam relative to males (and female percentage of total) increases over time, the male-female math test score gap should INCREASE over time, since an increasing number of females (and increasing percent of total) taking the SAT should lower female mean math test scores over time relative to male math test scores. Reason? The increasing number of females taking the SAT will "dip further down into the performance distribution" over time. 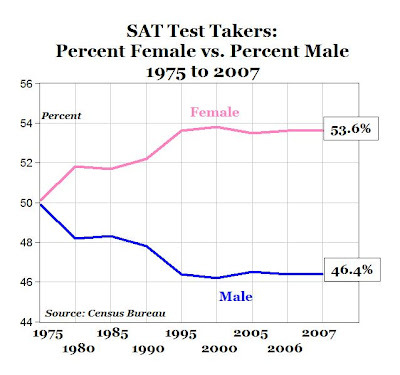 Using Census Bureau data, the chart below shows that females taking the SAT exam as a percent of the total increased from 50% in 1975 to 53.6%, as the male percentage has decreased from 50% to 46.4% over that period (see chart below). 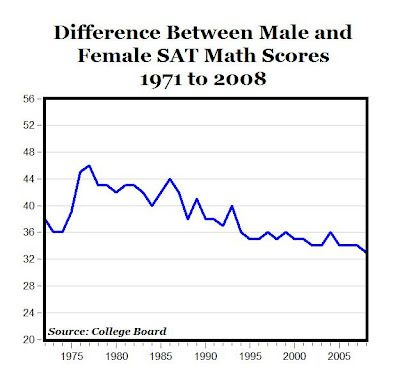 According to the reasoning above, as the number of females taking the SAT exam increased over time (along with the percent of total) relative to males, the mean female score should have decreased relative to the male mean score, and the male-female gap should be INCREASING over time, theoretically. But that is exactly the opposite of what has actually been happening. The chart below shows that the male-female gap has actually been decreasing over time, even as more females took the test relative to males, from a high of 46 points in 1977 to a gap of 33 points in 2008. Bottom Line: The gender gap appears to be more than just a sampling artifact, since the decreasing male-female math test score gap is exactly the opposite of what the Hyde et al. hypothesis would predict. Update: Additionally, if the number of females taking the test increases over time, the Hyde hypothesis would also predict a falling mean female math test score over time, when in fact we see the opposite: a rising female mean SAT math test score. Chart of the Day: Med. Equipment, Canada vs. U.S.
“Advocates of single-payer health care systems tend to promote the allegedly lower monetary costs, but they ignore the lack of access to medical resources,” said Brett Skinner, Fraser Institute Director of Health, Pharmaceutical and Insurance Policy Research and lead author of the peer-reviewed study: "The Hidden Costs of Single Payer Health Insurance: A Comparison of the United States and Canada." The study shows that health care in Canada appears to cost less relative to the United States because Canadian public health insurance does not cover many advanced medical treatments and technologies, common medical resources are in short supply, and access to health care is often severely delayed. Reason.tv: What If Government Ran Health Care? News from 1930: A daily summary based upon news from the Wall Street Journal from the corresponding day in 1930. John Stossel's Take: ABC News' Co-Anchor of "20/20" offers his libertarian views on the economy, education, health care and politics. NEW YORK, June 26 (Reuters) - A gauge of future U.S.economic growth rose, and its yearly growth rate turned positive, raising hopes that the end of the recession is insight, a research group said today. The Economic Cycle Research Institute, a New York-based independent forecasting group, said its Weekly Leading Index (WLI) rose to a 37-week high of 117.6 for the week ending June 19, from a downwardly revised 117.0 the previous week. The index's annualized growth rate spiked to a 97-week high of 2.1% from minus 0.6% a week ago. 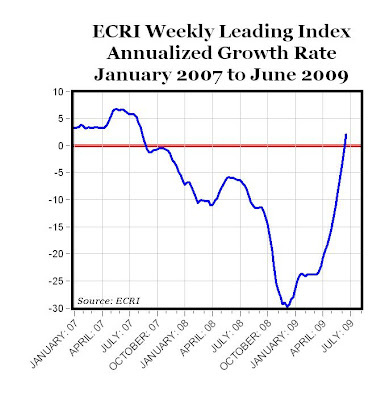 It was ECRI's highest yearly growth reading since the week ended August 10, 2007, when it stood at 3.4% (see chart above). "Following a 28-week upturn, WLI growth has broken into positive territory for the first time in over 22 months -- an affirmation that an end to the recession is at hand," said Lakshman Achuthan, managing director at ECRI. In 1979, Milton Friedman appeared on The Phil Donahue Show and discussed The Great Depression, the New Deal, the auto industry, auto (Chrysler) bailouts, greed, Amtrak, auto emissions regulation and airbags, Ralph Nader, tariffs, free trade, price controls and gas shortages, oil companies, etc., and other topics that are still relevant today. 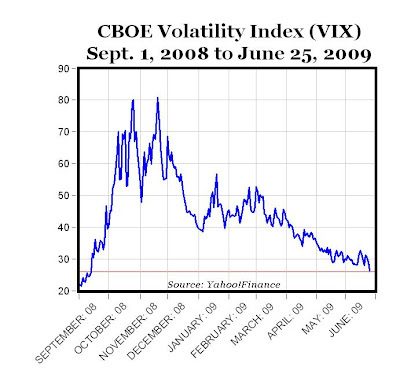 The CBOE Volatility Index (VIX) closed yesterday (Thursday) below 27 for the first time since September 12 of last year, and reached a new 9-month low of 26.36. From the November highs that peaked at almost 81, the VIX has fallen by more than 67%. LA TIMES -- Confidence among U.S. consumers rose this month for a fourth straight time, reflecting signs that the worst of the recession has passed. The Reuters/University of Michigan final index of consumer sentiment gained to 70.8, the highest level since February 2008, from 68.7 in May. Recent reports show some areas of the economy, such as housing and manufacturing, are seeing a smaller pace of decline, consistent with the Federal Reserve's projection this week that the slump is "slowing." Government data today indicated that efforts to revive the economy are allowing consumers to spend even with unemployment at a 25-year high. 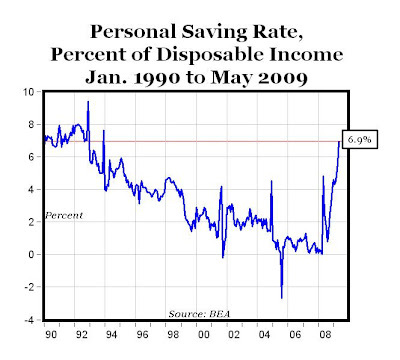 The data also showed savings surged to the highest level since 1993. MP: The last time the Michigan consumer sentiment index increased in four consecutive months was the period from October 2001 to January 2002, which signalled the end of the 2001 recession (see shaded area in chart above). 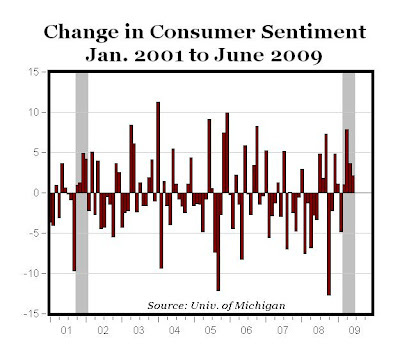 The four-month cumulative increase of 14.5 points in consumer sentiment from March to June 2009 (see shaded area in chart) is even greater than the 11.2 point increase in late 2001-early 2002. 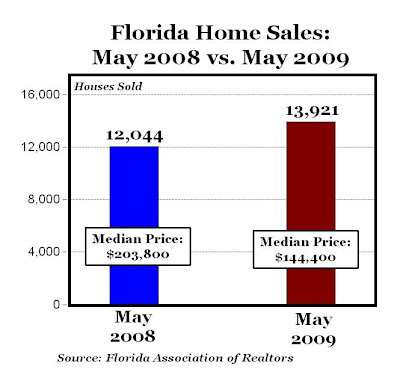 ORLANDO, FL (June 23, 2009) – Florida’s existing home sales rose in May – the ninth month in a row that sales activity increased in the year-to-year comparison, according to the latest housing data released by the Florida Association of Realtors (FAR). Statewide sales showed gains over the previous month’s sales level in both the existing home and existing condominium markets. Also, for the first time in many months, the statewide median sales price in May for existing homes and for existing condos ($144,400) rose over the previous month’s figure ($138,500) by 4.26%. Existing home sales rose 16% last month with a total of 13,921 homes sold statewide compared to 12,044 homes sold in May 2008, according to FAR (see chart above). Statewide existing home sales in May increased 6.2% over April’s statewide activity. Florida’s median sales price for existing homes last month was $144,400; a year ago, it was $203,800 for a 29% decrease. However, the statewide existing home median price in May ($144,400) was higher than the statewide median price reported in each of the previous four months ($139,500 in Jan., $141,900 in Feb., $141,300 in Mar. and $138,500 in Apr.). MP: Just like in California, we now have both rising home sales (units) and rising median home prices in Florida for May, suggesting that both markets have probably bottomed and are now in the early states of recovery. LOS ANGELES (June 25) – Home sales increased 35.2% in May in California compared with the same period a year ago, while the median price of an existing home declined 30.4%, the CALIFORNIA ASSOCIATION OF REALTORS (C.A.R.) reported (see chart above). “With affordability for first-time buyers at a record high, sales of existing, single-family homes continued to remain above the 500,000 level for the ninth consecutive month,” said C.A.R. President James Liptak. “Buyers are beginning to realize that the combination of favorable home prices, historically low mortgage rates, and first-time home buyer tax credits, may not align again for many years. 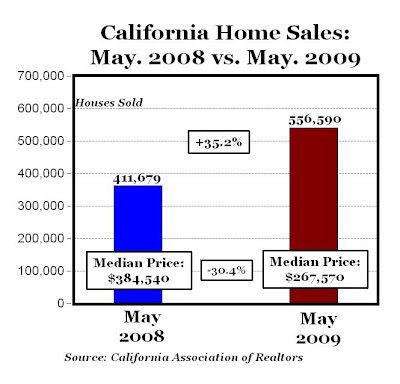 The median price of an existing, single-family detached home in California during May 2009 was $267,570, a 30.4% decrease from the revised $384,540 median for May 2008, C.A.R. reported. The May 2009 median price rose 4.2% compared with April’s $256,700 median price. “The statewide median price rose for the third consecutive month in May, posting the largest monthly increase on record for the month of May, according to statistics dating back to 1979,” said C.A.R. Chief Economist Leslie Appleton-Young. “Nearly all regions in the state reported positive month-to-month changes in median price." 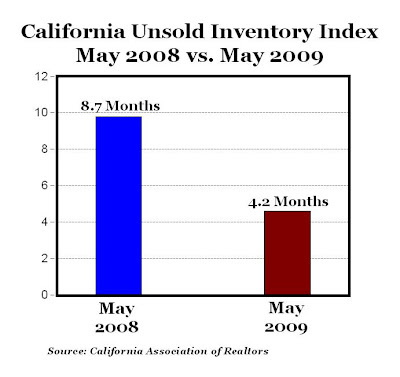 C.A.R.’s Unsold Inventory Index for existing, single-family detached homes in May 2009 was 4.2 months, compared with 8.7 months for the same period a year ago (see chart above). The index indicates the number of months needed to deplete the supply of homes on the market at the current sales rate. WALL STREET JOURNAL -- California's median price for an existing single-family house rose for the third straight month, a sign that the state's battered real-estate market may be bottoming out. California's real-estate market, the nation's largest, is seen as a barometer of the U.S. economy. Housing prices soared during the boom, and their plummet during the market's collapse resulted in massive foreclosures and fueled the recession. Economists say the state's housing market will lag behind the nation's in recovering, so any indication of improvement in California bodes well for the rest of the U.S.
WASHINGTON -- Households pushed their savings rate to the highest level in more than 15 years in May as a big boost in incomes from the government's stimulus program was devoted more to bolstering nest eggs than increased spending. The savings rate, which was hovering near zero in early 2008, surged to 6.9%, the highest level since December 1993 (see chart above). The Commerce Department said consumer spending rose 0.3% in May, in line with expectations. But incomes jumped 1.4%, the biggest gain in a year and easily outpacing the 0.3% gain that economists expected (see chart above). From 1980, when Milton Friedman appeared on The Phil Donahue Show to promote his new book "Free to Choose," and discussed topics that are still as relevant and current today as they were almost 30 years ago: deficit spending, regulation, Adam Smith, General Motors, bailing out Chrysler, monetary policy, airline mergers, auto safety, windfall profits tax, automobile dealers, subsidies, smoking laws, legalization of marijuana, monopoly, military spending, energy policy, etc. Corporate Profits Increased in Q1, Largest in 3 Yrs. 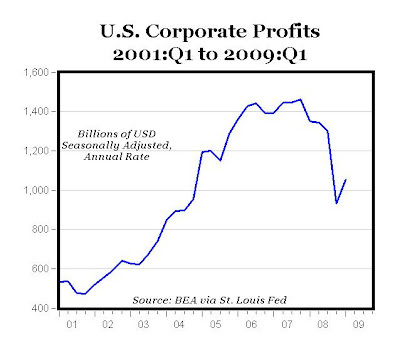 The BEA reported today that corporate profits (data here) increased in the first quarter of 2009 by $128 billion, the largest quarterly increase in more than three years, and the first quarterly increase in more than a year, following 4 consecutive quarterly decreases (see chart above). Gender differences in performance on the SAT Mathematics test are widely publicized and contribute to the public’s view that males excel in mathematics, compared with females. In 2007, males scored an average of 533 ± 114 (mean ± SD = 114) on the Mathematics portion of the SAT, compared with an average of 499 ± 111 for girls. For many reasons, these data tell us nothing about gender differences in mathematics performance. Chief among these reasons is sampling. The SAT is taken almost exclusively by college-bound students, and even then, some college-bound students do not take it because their intended college requires some other test such as the ACT. Therefore, there is no well-defined sampling frame that would permit broader generalization. Perhaps more important is the fact that, coupled with the current trend for more females than males to attend college, the SAT is taken by more females than males. MP: In an email, Greg Mankiw also made this observation, and so did Junkyard_Hawg1985 in several comments on this CD post. I'm not completely convinced that a difference in sample sizes could account for such a large difference in mean SAT math test scores (+30 points in all years). And that 30+ point male-female math test score gap existed even back in 1971 when the sample size issue was probably reversed: more men probably took the test back then than women, and it was probably the male group that "dipped further down into the performance distribution" than the female group. But even putting aside the issue of possible gender differences in mean SAT scores, we are still left with the huge gender disparity in math performance at the highest levels, which would have nothing to do with the sample size issue, and would have everything to do with the gender differences in the variability of test performance and/or intelligence. As the table above shows, males outnumber females by almost 2 to 1 for SAT math test scores above 750, and by 1.6 males to 1 female for test scores between 700-740. For the 650-690 range, males outnumber females by a factor of 1.38 to 1, and for the 600-640 range the ratio is 1:15 males to every female. For all of the other ranges except the bottom one, females outnumber males. So we are still left with the outcome of superior male math performance, at least at the highest levels of achievement, if not on an average basis. Then what about the issue of complete female dominance over males for the writing portion of the SAT exam, with a significantly higher mean score and overrepresentation at all of the highest score levels? A group of wealthy pensioners has been accused of kidnapping and torturing a financial adviser who lost about $4 million of their savings. The pensioners, nicknamed the "Geritol Gang" by German police after an arthritis drug, face up to 15 years in jail if found guilty of subjecting German-American James Amburn to the alleged four-day ordeal. President Obama objects when people use the word "rationing" in regards to government-run health care. But rationing is inevitable if we simply expand government control without fixing the way health care is reimbursed so that doctors and patients become sensitive to issues of price and quality. What will be new about government-run health care is the instrument of regulatory control. There will be an omnipotent federal health board. The idea of an omnipotent board that makes unpopular decisions on access and price isn't a new construct. It's a European import. In countries such as France and Germany, layers of bureaucracy like health boards have been specifically engineered to delay the adoption of new medical products and services, thus lowering spending. ■ Assessment of medical products is done by the Committee for the Evaluation of Medicines. ■ Reimbursement rates are set by the National Union of Sickness Insurance Funds, a group that also negotiates pay to doctors. ■ The Federal Joint Committee regulates reimbursement and restrictions on prescribing, while the Institute for Quality and Efficiency in Healthcare does formal cost-effectiveness analysis. ■ The Social Insurance Organization, technically a part of the Federal Joint Committee, is in charge of setting prices through a defined formula that monitors doctors' prescribing behavior and sets their practice budgets. ■ In the past 12 months, the 15 medical products and services that cleared this process spent an average 35 months under review (the shortest review was 19 months, the longest 51). In short, other countries where government plays a large role in health care aren't shy about rationing. Even Mr. Obama's budget director has acknowledged that rationing reduces costs. As Steve Chapman wrote, "The administration pretends we can get generous government-sponsored coverage for everyone without higher taxes, higher insurance premiums or rationing of health care." MP: In reality, with government-sponsered health coverage we will probably face a trifecta: higher taxes, higher premiums AND rationing. There's no brand loyalty that the offer of a "penny off" can't overcome it. LOS ANGELES, CA - Preliminary results of the latest National Retail Security Survey show that retail shrinkage averaged 1.52% of retail sales in 2008, up from 1.44% in 2007. According to the survey, total retail losses increased last year to $36.5 billion, up from $34.8 billion in 2007. According to the survey, the majority of retail shrinkage last year was due to employee theft, at $15.9 billion, which represented almost half of losses (44%). "While the economy plays a role in the amount of shoplifting around the country, these crimes are mostly the case of greed instead of need," said National Retail Federation's Joe LaRocca. "People aren't stealing to feed their families; they're stealing iPods, handbags, and other discretionary items." MP: We hear a lot about corporate greed (526,000 Google hits), but don't hear very much about consumer greed (27,300 Google hits), and even less about employee greed (only 1,990 Google hits). But as the story above highlights, many consumers and employees are quite greedy themselves, and they helped themselves to more than $36 billion worth of merchandise owned by the corporations that are so often accused of being "greedy," (or whose managers are accused of "greed"). Even the majority of consumers who don't shoplift, can still in fact be pretty ruthless, cutthroat and disloyal, read about it here. ASSOCIATED PRESS -- The recession steered a new type of customer to Wal-Mart - deeper in the pockets and suddenly looking for bargains. Now the world's largest retailer has to figure out how to keep that customer when the economy recovers. So Wal-Mart is bringing in more brand names, ditching scores of other products, and redesigning hundreds of stores to give them wider aisles, better lighting, and better sight lines. It's more than just a cosmetic upgrade. That new breed of customer also spends about 40% more than the traditional Wal-Mart shopper, and the retailer senses an opportunity to accelerate its growth. WASHINGTON -- The Spanish professor is puzzled. Why, Gabriel Calzada wonders, is the U.S. president recommending that America emulate the Spanish model for creating "green jobs" in "alternative energy" even though Spain's unemployment rate is 18.1%-- more than double the European Union average -- partly because of spending on such jobs? Calzada, 36, an economics professor at Universidad Rey Juan Carlos, has produced a report which, if true, is inconvenient for the Obama administration's green agenda, and for some budget assumptions that are dependent upon it. ~George Will's column "Tilting at Green Windmills"
2. We find that for every renewable energy job that the State manages to finance, Spain’s experience cited by President Obama as a model reveals with high confidence, by two different methods, that the U.S. should expect a loss of at least 2.2 jobs on average, or about 9 jobs lost for every 4 created, to which we have to add those jobs that non-subsidized investments with the same resources would have created. 3. The study calculates that since 2000 Spain spent €571,138 ($800,000) to create each “green job”, including subsidies of more than €1 million ($1.4 million) per wind industry job. The study calculates that the programs creating those jobs also resulted in the destruction of nearly 110,500 jobs elsewhere in the economy, or 2.2 jobs destroyed for every “green job” created. Even if the "stimulus" package doesn't seem to be doing much to stimulate the economy, it is certainly stimulating many potential recipients of government money to start lining up at the trough. All you need is something that sounds like a "good thing" and the ability to sell the idea. The 2008 SAT Math scores (see table above, click to enlarge) reveal statistically significant ethnic differences. Difference-of-means tests (not reported here) reveal that Asians score significantly higher on average than Whites, who score significantly higher on average than American Indians, who score significantly higher on average than Mexicans, who score significantly higher than other Hispanics, who score significantly higher than Puerto Ricans, who score significantly higher than Blacks/African Americans. All differences are statistically significant at the 1% level. Additionally, gender differences on the math SAT exist for all ethnic groups, see table below. For each major ethnic group (Asian, White, American Indian, Other Hispanic, Mexican, Puerto Rican and Black), the mean score for males on the 2008 SAT exam are statistically significantly higher (1% level) than the mean score for females. In many cases, the ethnic differences on the SAT math exam outweigh the gender differences. For example, Asian females score significantly higher on average than males of any other ethnic group, white females score significantly higher than males of any ethnic group except Asians, American Indian females score significantly higher than black or Puerto Rican males, and females from all ethnic groups except black/African-American score significantly higher than black males. All significant levels are 1%. Bottom Line: There are statistically significant ethnic and gender differences on the SAT math exam. 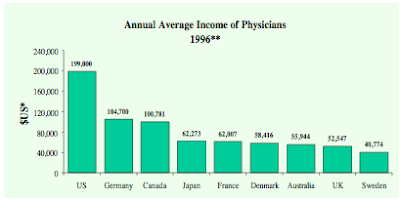 Greg Mankiw features the chart above on physicians' salaries in the U.S. vs. various European countries and Canada, showing that MDs in the U.S. make about $200,000, which is between 2 and 5 times as much as doctors make in other countries. How do we explain the significantly higher physician salaries in the U.S.? In 1963, there were only 135 law schools in the U.S. (data here), and now there are 200, which is almost a 50% increase over the last 45 years in the number of U.S. law schools. Unfortunately, we've witnessed exactly the opposite trend in the number of medical schools. There are 130 medical schools in the U.S. (data here), which is 22% fewer than the number of medical schools 100 years ago (166 medical schools, source), even though the U.S. population has increased by 300%. Consider also that the number of medical students in the U.S. has remained constant at 67,000 for at least the period between 1994 and 2005, according to this report, and perhaps much longer. Because of the significant increase in applicants for a much smaller increase in available openings in medical school, the percent of medical school applicants accepted has decreased from 47.5% in 2003 to 42% in 2007, before increasing to 42.7% in 2008, see chart below. Bottom Line: One reason we might have a "health care crisis" due to rising medical costs, and the world's highest physician salaries is that we turn away 57.3% of the applicants to medical schools. What we have is a form of a "medical cartel,: which significantly restricts the supply of physicians, and thereby gives its members monopoly power to charge above-market prices for their services. In his classic book Capitalism and Freedom, Milton Friedman describes the American Medical Association (AMA) as the "strongest trade union in the United States" and documents the ways in which the AMA vigorously restricts competition. The Council on Medical Education and Hospitals of the AMA approves both medical schools and hospitals. By restricting the number of approved medical schools and the number of applicants to those schools, the AMA limits the supply of physicians. In the same way that OPEC was able to quadruple the price of oil in the 1970s by restricting output, the AMA has increased their fees by restricting the supply of physicians. If we had 130 law schools (instead of 200) and 200 medical schools in the U.S. (instead of 130), it would probably go a long way to solving our "health care crisis." More MDs at much lower salaries along with fewer lawyers and lawsuits would be a good thing, wouldn't it? Can't breaking up the medical cartel, training more physicians, and lowering MD salaries be part of the discussion for health care reform? On a previous post, I documented the statistically significant male-female test score gap for the 2008 SAT math exam, and the graph above shows that this statistically significant difference of more than 30 points has persisted over time. Could the male-female SAT math test score gap be explained by: a) males taking more math classes than females in high school, or b) males demonstrating higher performance in high school math classes than females, or c) male high school students having higher GPAs than female students? The answers appear to be NO, using data from the 2008 SAT report. Table 13 below (click to enlarge) shows that female high school students dominate male students at the highest GPA levels (A+, A and A-) by wide margins, and male students dominate female students at the lowest GPA levels (C, D, E or F). For example, there are 150 female students earning GPAs at the highest A+ level for every 100 male students, and there are 160 male students earning GPAs at the lowest D/E/F level for every 100 female students. Further, the overall GPA for all female students (3.38) is higher than the overall GPA for male students (3.23). Table 14 below (click to enlarge) shows that there is essentially no male-female difference for average years of math study (3.9 years for males vs. 3.8 years for females) or math GPA (3.12 for both male and female students). Table 15 below (click to enlarge) shows no male-female differences for: a) years of math study or b) highest level of math achieved, and shows that the 54% of students taking AP/Honors math classes are female vs. 46% male. That is, there are 117 female students taking AP/Honors math classes for every 100 male students. Bottom Line: Female high school students are better students on average compared to male high school students, and they are equally or better prepared than males for the math SAT exam based on the number and level of math classes taken in high school. 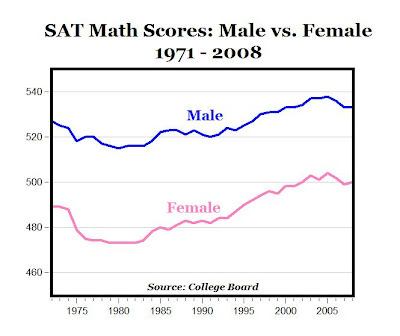 And yet, male students score significantly higher on the SAT math test than females, and the statistically significant male-female test score gap of more than 30 points persists over time. Based on the statistical evidence, is there any other conclusion than this obvious one: In general and on average, male high school students in the U.S. are just plain better at math than female high school students? If there are other reasonable conclusions, please share them. And yet, we hear statements like this: "There just aren't gender differences anymore in math performance," says University of Wisconsin-Madison psychology professor Janet Hyde. Stereotypes are very, very resistant to change," she says, "but as a scientist I have to challenge them with data." Do those data include publicly available SAT score data showing statistically significant gender differences in math scores that persist over time? Apparently not. Between 1998 and 2008, the percentage of college-bound high school seniors with a GPA equal to letter grades of A+, A or A- increased from 38% to 42%, while the average SAT scores for that group decreased by 15 points from 565 to 550 for the Reading section, and by 19 points from 578 to 569 for the Math section (data here from The College Board, Table 17). WASHINGTON (Dow Jones) -- Existing-home sales improved again in May, but falling prices and bloated supply promise to make a housing sector recovery slow. 5. The 9.6 months supply of inventory in May is below last year's May level of 10.9 months by more than five weeks, and is at the second-lowest level in the last year. The data today are consistent with our outlook that the economy is recovering from a panic. Home sales, building activity, and the rate of decline in home prices all seem to be bottoming or have already formed a bottom. In fact, the level of existing home sales in May was the highest since October 2008. Great economic data and free services are available from the National Bureau of Economic Research, where you can register to receive free e-mail notifications of more than 100 different economic releases. You can also access all of the hundreds of current and archived economic reports, and view the release schedule for each report. Manufacturing activity in the central Atlantic region advanced somewhat faster in June, according to the Richmond Fed’s latest survey. The seasonally adjusted manufacturing index — our broadest measure of manufacturing activity — jumped to 6 from May’s reading of 4 (see chart above). Looking at the main components of activity, new orders expanded further, while factory shipments grew at a slightly slower rate and employment exhibited more moderate weakness. Other indicators were mostly positive. Backlogs increased for the first time since August 2007, while vendor delivery times stabilized and capacity utilization edged higher. In addition, manufacturers reported somewhat quicker growth in finished goods inventories. MP: Signalling the end of the 2001 recession, the Richmond Fed Manufacturing Index was above zero by early 2002 when the U.S. economy was officially in economic recovery (see chart above). The Richmond Fed index has increased 61 points since the end of 2008, and has now been in positive territory for two consecutive months for the first time since the summer of 2007, suggesting that the recession has ended in the Richmond Fed region (MD, VA, WV, NC, SC and DC). There have been a lot of somewhat-sensationalized descriptions by the media of the current recession ("Worst economic crisis since the Great Depression®, "Great Depression II™," etc. ), and I'm wondering how the media will describe the pending economic recovery? We'll probably be more likely to hear descriptions like "The Slowest/Weakest Most Sluggish Economic Recovery Since ______" than descriptions like "The Greatest/Fastest/Strongest Economic Recovery Since _____." NEW YORK, June 19 (Reuters) - A gauge of future U.S. economic growth rose along with its yearly growth rate, reaffirming hope that yearly growth will turn positive in the summer months, a research group said on Friday. The Economic Cycle Research Institute, a New York-based independent forecasting group, said its Weekly Leading Index (WLI) rose to a 36-week high of 117.1 for the week ending June 12, from an upwardly revised 116.2 the previous week (see chart above). In recent weeks, the group has forecast that the U.S. recession will end sometime during this summer, as its yearly economic growth reading rebounds from late-2008 lows. The index's annualized growth rate spiked to an 85-week high of minus 0.6 percent from the prior week's revised rate of minus 3.5 percent (MP: And compares favorably to the year-end growth rate reading of -28.1%, see data here). "With WLI annualized growth rocketing up almost 30 percentage points in six months (MP: from -28.1% in December), it's virtually pounding the table about the recession ending this summer," said Lakshman Achuthan, managing director at ECRI. MP: The WLI has increased nine weeks in a row - the last time that happened was almost 20 years ago - and the index has increased in 13 out of the last 14 weeks (data here). The index of future economic activity is now at a 9-month high of 117.1, the highest level since October 3 of last year (see chart above). Further, the 12-point, three-month increase in the WLI from the early March low of 105.1 is the largest three-month gain in the history of the WLI back to 1967. Canada's oil sands hold an estimated 170 billion barrels of oil that can be recovered with existing technology and as much as 1.7 trillion barrels -- more than five times the size of Saudi Arabia's reserves -- that could be produced with the use of new methods that are being developed. As the only non-OPEC source with the capability for large production growth during the next several years, oil sands have the potential to reduce the Organization of Petroleum Exporting Countries' revenues, weakening the cartel and those members that often undertake policies hostile to U.S. interests. By getting more of their oil from Canada, refineries in the Midwest are moving from being at the back of the crude oil supply line to the front. With these secure supplies, Midwest refineries are not as vulnerable to supply disruptions from overseas producers or hurricanes in the Gulf of Mexico. So who would object to Canadian oil sands? Eenvironmental groups like the Natural Resources Defense Council and the Sierra Club are trying to shut down Canadian oil sands production and block the expansion of refineries here in the U.S. If the environmental groups truly cared about achieving results in their battle against global warming, they would better focus their energy on the construction of scores of power plants in rapidly developing economies like China and India that account for most of the increase in the world's carbon emissions. These developments pose the real global environmental danger, not the Canadian oil sands. Five years ago the governments of Canada resolved to improve wait times for health care by committing nearly $6 billion to the cause. Although there are signs of improvement, the lack of uniform and timely information on wait times is just one symptom of the ‘unfinished business’relating to wait times in Canada. What’s going on? ■ Based on the UK's National Health Service target of 18-weeks from initial referral by a family physician to start of treatment, a majority of Canadian patients had wait times that exceeded the 18-week target. Access is particularly poor for: ophthalmology (adult strabismus), obstetrics and gynecology, gastroenterology, plastic surgery and orthopedics. ■ The median wait for radical (curative) cancer care was 46 days or nearly 7 weeks and the majority of these treatments exceeded the Canadian Association of Radiation Oncology benchmark for curative cancer treatment of 4 weeks (2 weeks for the consult wait and 2 weeks for treatment). This is troublesome given the clear link between a delay in radiation therapy and a chance of cure. ■ The study found that the median wait time from the time the patient presented at the Emergency Department to the time the patient was discharged (i.e., the patient did not need to be admitted to an inpatient bed) was almost 6 hours, while the average wait was nearly 9 hours, both much longer than the benchmark of 4 hours. 19 hours (average is 23.5 hours or nearly one full day), which is substantially higher than the established thresholds (e.g., more than three times the 6 hour guideline for high-level acuity patients). The longer wait for patients to be admitted is often due to the inability to find an available hospital inpatient bed. Update: Both charts above and the comments below have been updated, based on using 10-year constant maturity yields for both Treasury series (thanks to Michael Pond for suggesting this). 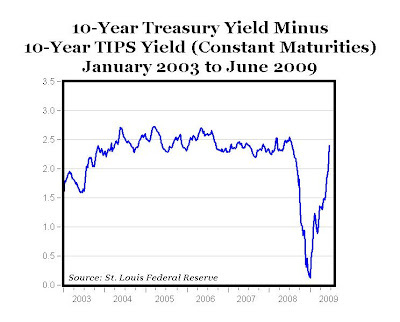 The top chart shows the weekly, bond market-based 10-year TIPS-derived expected inflation back to 2003, calculated as the difference between 10-year regular, nominal Treasury yields and 10-year Treasury inflation-indexed yields, both on a constant maturity basis (St. Louis Fed data here for 10-year TIPS and here for regular 10-year Treasuries; see the bottom chart for those yields separately. 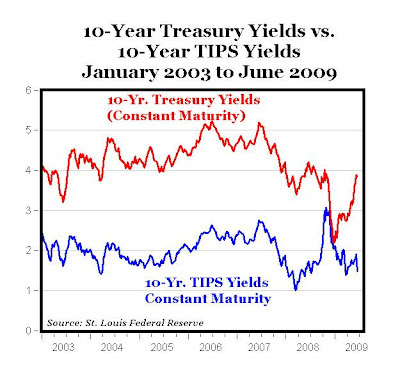 After an unusual period in late 2008 resulting in a narrowing spread when the TIPS 10-year yields were unusually high and approaching 3%, and regular Treasury yields were unusually low and approaching 2%, the Treasury market seems to have stabilized, and the bond market's 10-year expectation of inflation is back around 2.5%, consistent with the inflationary expectations from 2003-2007. The beginning of May marks the end of income tax season in Canada. Over one-half of the personal income taxes Canadians just paid in aggregate are required to cover the cost of our taxpayerfunded health care program. Given this level of expenditure, you might expect that Canadians receive world-class access to health care. But the evidence demonstrates that this is not so. 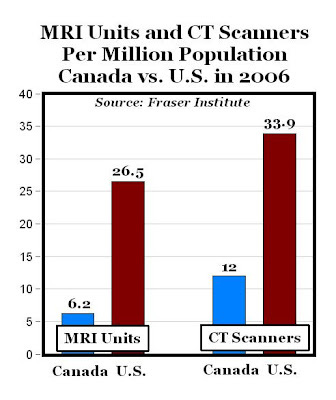 Consider Canada’s waiting lists, which are among the longest in the developed world. ■ In 2007, waiting lists for access to health care in Canada reached a new all-time high of 18.3 weeks from general practitioner referral to treatment by a specialist. Despite substantial increases in both health spending and federal cash transfers to the provinces for health care over the last decade or so, this wait time is 54% longer than the overall median wait time of 11.9 weeks back in 1997. That is hardly the sort of access you might expect from the developed world’s third most expensive universal access health insurance system.